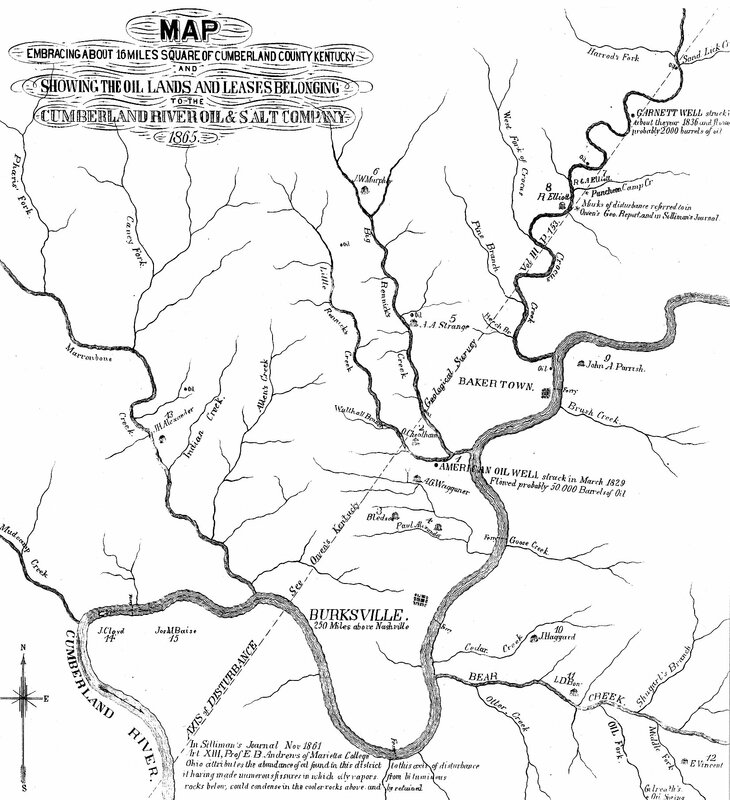 1541, Kentucky: DeSoto marches north through parts of western Kentucky. Modern locations along route include Fort Campbell through Hopkinsville, Madisonville, and Sebree to Henderson (FloridaHistory.com). 1622: French missionaries discover Indians igniting natural gas in northwestern New York (FMGP, 2004). 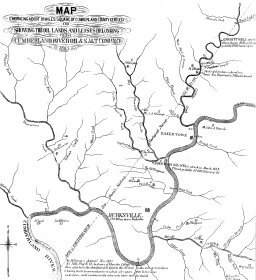 1818, Kentucky: Martin Beatty, operator of an iron furnace near Abington, Virginia, acquired property and contracted with Marcus Huling and Andrew Zimmerman to drill a well for salt water at the confluence of (what is now) Oil Well Branch and the Big South Fork of the Cumberland River, McCreary County. In early December, the well came in with an initial flow estimated to be 100 barrels of oil per day. Beatty abandoned intentions of producing salt from the well, established a salt works 2 miles downstream at the mouth of Bear Creek, and later entered politics. Beatty, Huling, and Zimmermen hired two fishermen, Pierson Watson and John Spradling, to ferry the oil downstream in wooden barrels. Two attempts to navigate the narrows at Devil's Jump resulted in disaster and a near drowning. The oil was hauled overland by wagon to local merchants who sold it to the makers of British Oil, Seneca Oil, Mustard Liniment and other similar medicinal preparations with quantities being distributed in Kentucky, Tennessee, Virginia, North Carolina, and Georgia. The expense of hauling the oil soon led the venture to be abandoned. Beatty continued with salt-making. He moved the operation downstream, below the narrows, possibly near the vicinity of the present crossing of the Big South Fork near Yamacraw (Highway 92). (Jillson, 1952, United States Congress) Jillson's 1952 account of this well is available online. The DjVu Web browser plug-in is required to view scanned records. 1825: William A. Hart of Fredonia, New York, drills a 27-foot deep well into an outcrop of Devonian shales, a natural gas seep, and produces gas for street lamps. (Office of Fossil Energy, 2001, Orton, 1891). This event is often dated to 1821, but Lash & Lash (2011, http://www.aapg.org/explorer/2011/09sep/natgashist0911.cfm) have located contemporaneous documentation of the 1825 event. 1840, Kentucky: An entrepreneur from Pittsburgh recalled stories of the well at Burkesville and traveled there to make suitable arrangement for bottling it. (Jillson, 1947) This could have been Kier or possibly Job Moses (1848). The 1840 date is uncertain. 1846: Samuel Kier, a Pittsburg druggist, "conceived the idea of saving the 'grease,' which for years had run waste from his and other wells, and in 1846 he bottled it as a medicine." (McLaurin, 1896) Note that this is later than dates cited elsewhere, but Kier certainly was selling bottled crude oil in the 1840's. 1858, Kentucky: Discovery of Old Rock Haven field, Meade County (Eyl, 1922) Probably a shallow (less than 300') New Albany Shale gas field at the eastern margin of the Illinois Basin. Jillson (1922, p. 53) discusses the Meade County Gas Field and states the first well drilled in the field was in 1858. Jillson (pps. 32 and 54) provides maps of the field that show the vicinity of the Meade County Gas Field to be mostly coincident with the Rock Haven Field as shown by Eyl.